"I grew up eating a similar tuna salad, I have since adjusted it to be a little healthier than before. The apples make it fresh and delicious! Serve on bread of your choice with lettuce. Yum!" 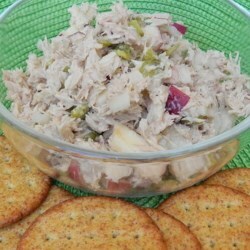 Stir the tuna, olive oil, mayonnaise, apple, onion, relish, and dill together in a bowl until evenly mixed. Season with salt and pepper. You can serve immediately, though is tastes much better after being refrigerated overnight. Spice up tuna salad with a little curry and Parmesan. This was ok for something different, but it's not something I would make again. The dill was too overpowering for my taste. This was a very good recipe. I did add a lot more mayo though because without it the recipe was way too dry. Really great. I made it per the recipe. The pic shown has to have more than 1 T of mayo. Mine didn't look like that at all. But it was really good and I'm sure I'll make it again and again. Wonderful. Double the mayo and add 1/4 cup of pecans and it is perfection! Serve on toasted bread with lettuce and a thin slice of tomato. My husband absolutely loved it. Wasn't to sure about the apples in his tuna, but he said they added a nice crunch to the tuna salad. Thanks for the recipe! This recipe saved me on a day when I was out of celery, and we liked it with the apple! I did add some slivered almonds for a little extra crunch.